One of the most powerful aspects of Propertybase is the ability to track all of your business relationships in one place. 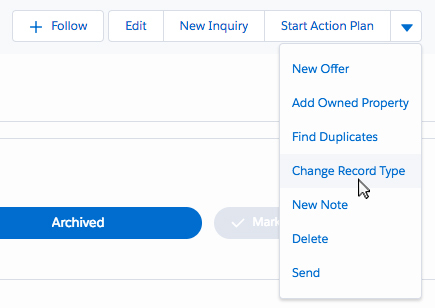 The Contact object in Propertybase allows you to capture client information, manage conversion rates, connect with new clients and close more deals. A Contact is simply a record of an individual or a company. The individual can be a lead, a customer or a partner. Contact records represent a business relationship to an individual or a relationship to another business. Sometimes a contact gets created as the wrong record type and needs to be changed from Individual to Company. To do this, open the Contact record and select "Change Record Type" from the actions panel. Contact records can be viewed by clicking the Contacts tab (for Individual contacts) or Companies tab (for Company contacts). You can also access an individual Contact directly by clicking the drop down arrow. 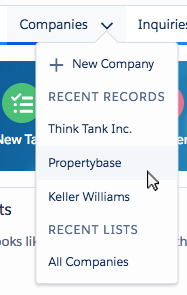 When you open a Contact record in Propertybase you will see Contact actions at the top of the page. Here you can perform a variety of actions based on the record selected. Immediately below actions you will see Contact details. This section displays the most relevant data for a Contact so that you can reference the information quickly and regularly. Below Contact details is the Contact path. This is a visual representation of a given contact’s current status. You can update this by clicking any stage and selecting “mark as current status”. Underneath the contact path, is a series of tabs. The first tab, Details, displays additional Contact information for a given record. This includes everything from name and phone number, to qualification details as well as other information like address, birthday and custom notes. Under the Related tab, you will find a list of objects containing records that relate to the current Contact record. The Related tab is one of the most powerful features of Propertybase. Here you can cross-reference data and view relationships between separate objects. The Matching tab shows a list of properties that match the Inquiry data for this Contact. You can search and filter these results as well as send properties to the current Contact directly from this screen. The Email tab, also known as Quick Send, is your one-stop shop for sending email within Propertybase. From here you can email the current Contact (or multiple Contacts) with various formatting options via templates and layouts. Click here for more information on Quicksend. In addition to the primary features listed above, the Contact object in Propertybase has access to a variety of secondary features like activity, tracking and chatter. These are located on the right side of the screen. Under the Activity tab, you can perform a variety of tasks associated with the current record. These tasks are then tracked below under Past Activity. The Tracking tab shows all emails sent to the current Contact though Quick Send. Here you can see how many have viewed the email and whether or not it was opened. [MUSIC PLAYING] One of the most basic functions of any CRM system, including Propertybase is the ability to track your contacts. And to do this in Propertybase, there's actually a variety of ways. However, the easiest one is probably to go straight to Create New Lead or Contact right from your home screen. So click on OK. And this brings us to the next screen, where we can easily enter in the data for our individual that we have spoken to. So let's say her name is Kathy. And let's go ahead and call her Ms. Kathy Smith. Maybe we know her email is kathy@gmail.com. And her mobile number perhaps is 555-2323. And the lead source where we found this from is from Other. And all we do is click on Save. Now once we save, we enter into what's called the Contact Detail page. And what that is is a place where we can really fill out more information on this person. We can see there's a Stage field here. So right now, maybe she's a lead because we've just met her, and we want to try to sell her something or get her listing. And there's different stages throughout this so we can track our clients throughout the process. We'll go more into that in another video. But as we get to know the person better, we can fill out their mailing address, their birth date, the company they might work for. And any other information you track or you need to track about your contacts can be added in here easily. Another example. Let's go back to the home screen of how to use the contact, the Create New Lead or Contact button that's actually really useful. Now let's say, for instance, you're not sure, actually, if you remember entering her. So we enter her name again. Kathy Smith down here. Oh, wait. The system just popped up with a potential duplicate, saying, do you mean Kathy Smith, whose number is this, and this is her email? So what you do actually is you save yourself the making of a duplicate record, a really handy feature. And that's why I suggest you use the Create New Contact button from your home screen to input any new contacts. Contacts in Propertybase are simply a record of an individual. The individual can be a lead, a customer or a partner. Contacts can also represent a business relationship to an individual or a relationship to another business. One of the key benefits of using a fully featured CRM product is to track all the relationships that you have to your customers. At the bottom of the contacts screen you can see related lists containing information about activities, listings and many other related records throughout Propertybase. Individual Clients - These are contacts that you track that are interested in your business, but have no ties to any specific company. For example a family looking to buy a home. Company Contacts - These are business contacts that will be specifically related to a company within Propertybase. This way you can relate multiple contacts to a company record and view all contacts that work for that particular company. For example, multiple brokers working for an agency. Note: "Propertybase is an Application on Salesforce. As Salesforce requires an account/company for every contact, Propertybase creates an “hidden” account for every individual contact in the background. You can find those via search or recent companies but when you click on it, it will always open the individual contact directly." This is Part 2 of 12 in our Getting Started with Propertybase series. We recommend you continue to follow along, in order, as we walk through the entire Propertybase process, from lead to close. Everything starts with the Contact, but another important part of the Propertybase process is managing activity. Activity management is an ongoing process that overlaps multiple objects. Everything from logging calls, creating tasks, scheduling showings and sending emails. Click here to learn about managing Activity in Propertybase.